If you are like most boat owners, you not only own your boat, you LOVE your boat. You take it out onto the water as often as you can to enjoy being outdoors — maybe you love to fish, or you like to take your family tubing or skiing. Regardless of your favorite boating activity, over time your boat may begin to show normal wear and tear or you may notice damage from a storm or from a minor accident. Anchor Marine Repair is the Twin Cities #1 boat repair company in the area, providing the highest quality boat repair and experienced technicians with a passion for boats. 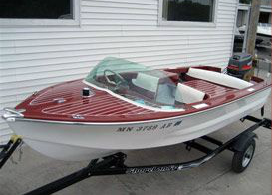 The team at Anchor Marine Repair can complete fiberglass repair, metal flake repair, and aluminum boat repair for collision, structural, and storm damaged boats. Anchor Marine Repair boasts two large state of the art facilities with a combined 10,000 square feet of working space. We have two spray booths and can accommodate boats up to 38’ long. Our ultimate goal is to get your boat back to its best condition as soon as possible so that each of our customers can be back on the water ASAP! Our experienced technicians each bring more than a decade of experience working for Anchor Marine Repair and will work to protect your investment and restore your boat properly. Anchor Marine Repair makes the repair and refurbishment process as easy as possible for you. We are happy to work directly with your insurance company when needed to coordinate your claim and our prices are among the most affordable in the area. A member of our team can come pick up your boat (within 250 miles of St Paul/Minneapolis) and transport it to our facility, complete the work and then deliver your boat back to you. We can also provide you a free estimate and consultation so that you know exactly what you will get for your money. If you have been thinking about making improvements or enhancements to your boat, or if your boat is in need of repair, call the team at Anchor Marine Repair at 763-972-3540 for more information.